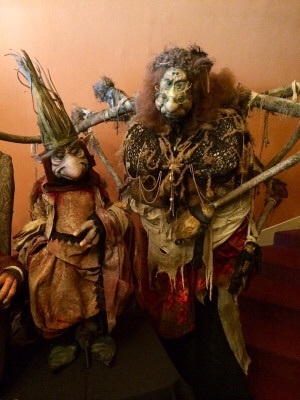 In case you missed it last week, Toby Froud, the baby in the striped PJs from the movie Labyrinth, grew up, moved to Portland for a job at LAIKA, and premiered his own fantasy puppet film on Saturday in collaboration with Jim Henson’s daughter, Heather. He might not have been raised by Goblin King Jareth (a.k.a. David Bowie in an explosion of lace and locks) and his goblin hordes in real life, but he came as close to it as possible, growing up the son of Brian and Wendy Froud, the reigning artistic royalty behind The Dark Crystal, Labyrinth, and an entire illustrated world of faeries and goblins with an international following. In the few days before the screening of Toby’s Lessons Learned, the buzz grew so deafening that I think it’s worthy of its own phrase: the Froud Frenomenon. Our interview with himwracked up 100,000 visits in the first two hours, and has gone on to some 300,000. (For those who are interested, in our poll of favorite songs, “Magic Dance” is squeaking out “As the World Falls Down” by 3 percent, 38 percent to 35, after nearly 5000 votes from 45 countries and all 50 states. The screening itself was an event: folks dressed in faerie horns flying kites on the sidewalk, people of all ages flooding the lobby, tickets so oversold that the Hollywood opened the upstairs theater for a second simultaneous screening, and at the center of it, Toby with both his parents holding court in front of the film’s spectacular cast of puppets. In other words, just as Toby has embraced the Froudian legacy of his parents, so too have the people embraced him as the goblin heir, with the hope that the wondrous world the Frouds created might once again grace theaters and imaginations. Call it 80’s nostalgia or a backlash to soulless CGI, but hand-made, hand-operated puppets still possess the magic to enchant like nothing else. Lessons Learnedscreened as part of three puppet shorts produced by Heather Henson’s company, Ibex Puppetry, for its Handmade Puppet Dreams film series. It’s worth noting that the second short, “Melvin the Birder,” was a charming paper cutout work also created by Portlanders, Beady Little Eyes Productions, about a birder’s quest to photograph the elusive Mustard Billed Wood-pecking Belly Wiggler. But the centerpiece was Lessons Learned, a 15-minute tale about a boy whose grandfather gives him a “lessons learned” box, a physical receptacle of sorts to collect all the things he learns in his life. The curious boy can’t help but look inside his grandfather’s box (now a trunk), only to be pulled into a musty storage room where his grandfather’s lessons (e.g. “when it rains, it pours”) are catalogued in boxes that come alive when the boy reads them. The boy eventually ends up in another world of stone spires and swirling mists, where he confronts King Time and Granny Fate as embodied by an old grey man and a female spider who is knitting the course of time, respectively, before his grandfather pulls him out. Toby’s puppets pick up right where his parents’ creations left off (which is not surprising, given his father helped with their design and fabrication). They are fantasy made foam-flesh:pointed ears twitch, elfin eyes blink, our spider lady sports stacked spectacles for her eight eyes. The production values, too, are exceptional. No doubt thanks to the many LAIKA professionals who lent their skills, the camera work, editing, and sound design coalesce to create an expansive world that feels just as mystical and captivating as The Dark Crystal and Labyrinth. More than anything, it felt like an exhilerating beginning.The short is more of a teaser for a bigger story than a narrative complete in itself, but it’s a story and a world for which audiences seem ravenous. We can only hope that Lessons Learned signals a new Froudian/Henson collaboration, where new tales will immerse us, and a new generation of fans, in the fantastical world of Froud. If you missed the world premiere, Lessons Learned will screen again as part of the Portland Film Festival in August. For those not in Portland, it has been selected as part of FilmQuest in Salt Lake in July, and will possibly play at festivals elsewhere pending acceptance. We'll be sure to update screening dates as we get them.